Raumfahrt+Astronomie-Blog von CENAP - Blog: Mars-Chroniken - NASA-Status-Bericht zur ersten "Mars-Bohrung"
This image from NASA's Curiosity rover shows the first sample of powdered rock extracted by the rover's drill. The image was taken after the sample was transferred from the drill to the rover's scoop. In planned subsequent steps, the sample will be sieved, and portions of it delivered to the Chemistry and Mineralogy instrument and the Sample Analysis at Mars instrument. The scoop is 1.8 inches (4.5 centimeters) wide. The image was obtained by Curiosity's Mast Camera on Feb. 20, or Sol 193, Curiosity's 193rd Martian day of operations. The image has been white-balanced to show what the sample would look like if it were on Earth. A raw-color version is available (see inset above). PASADENA, Calif. -- NASA's Mars rover Curiosity has relayed new images that confirm it has successfully obtained the first sample ever collected from the interior of a rock on another planet. No rover has ever drilled into a rock beyond Earth and collected a sample from its interior. Transfer of the powdered-rock sample into an open scoop was visible for the first time in images received Wednesday at NASA's Jet Propulsion Laboratory (JPL) in Pasadena, Calif.
"Seeing the powder from the drill in the scoop allows us to verify for the first time the drill collected a sample as it bore into the rock," said JPL's Scott McCloskey, drill systems engineer for Curiosity. "Many of us have been working toward this day for years. Getting final confirmation of successful drilling is incredibly gratifying. For the sampling team, this is the equivalent of the landing team going crazy after the successful touchdown." The drill on Curiosity's robotic arm took in the powder as it bored a 2.5-inch (6.4-centimeter) hole into a target on flat Martian bedrock on Feb. 8. The rover team plans to have Curiosity sieve the sample and deliver portions of it to analytical instruments inside the rover. 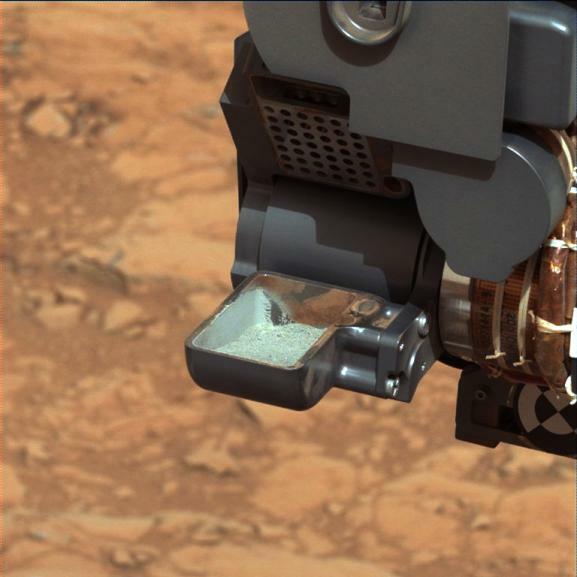 The scoop now holding the precious sample is part of Curiosity's Collection and Handling for In-Situ Martian Rock Analysis (CHIMRA) device. During the next steps of processing, the powder will be enclosed inside CHIMRA and shaken once or twice over a sieve that screens out particles larger than 0.006 inch (150 microns) across. In response to information gained during testing at JPL, the processing and delivery plan has been adjusted to reduce use of mechanical vibration. The 150-micron screen in one of the two test versions of CHIMRA became partially detached after extensive use, although it remained usable. The team has added precautions for use of Curiosity's sampling system while continuing to study the cause and ramifications of the separation. The sample comes from a fine-grained, veiny sedimentary rock called "John Klein," named in memory of a Mars Science Laboratory deputy project manager who died in 2011. The rock was selected for the first sample drilling because it may hold evidence of wet environmental conditions long ago. The rover's laboratory analysis of the powder may provide information about those conditions. NASA's Mars Science Laboratory Project is using the Curiosity rover with its 10 science instruments to investigate whether an area within Mars' Gale Crater ever has offered an environment favorable for microbial life. JPL manages the project for NASA's Science Mission Directorate in Washington.